This weeks card is made for my granddaughter that is turning 14 in May. Time goes so fast, it wasn't long ago and she was our little baby in diapers. The card base is white card stock and cut at 7 x 10 and folded in half to make a 5 x 7 card. The first layer is soft sky then on top is another piece of white that I stamped my images on. The stamp sets I used are SU Work of art and the butterflies are by Art Company that comes with five butterflies and dies to match. I used SU ink pads soft sky and pretty in Pink. I added pearls in the center of the butterflies. 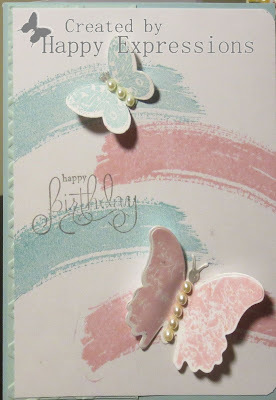 Its a soft and lovely card for a teen. I will add this card into this challenge. Thank you for stopping by for a visit and have a fabulous day! Love the brush strokes on the background. The butterflies are beautiful. Thanks for playing along Simon Says Stamp Anything Goes Challenge.